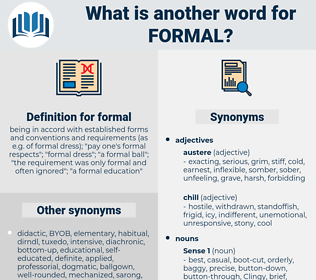 What is another word for formal? being in accord with established forms and conventions and requirements ( as e. g. of formal dress); " pay one's formal respects"; " formal dress"; " a formal ball"; " the requirement was only formal and often ignored"; " a formal education"
institutionalized, traditional, institutionalised, procedural, conventional, unofficial, full-fledged, theoretical, celebratory, classical, categorical, explicit, well-structured, normal, typical, nominal, regularized, form-factor, magisterial, scholastic, definitive, authentic, structured. Forums, matters, patterns, requirements, Languages, skills, Territories, structured. marked, Commenced, opened, Became, recorded, paid, Went. formalistic, formalised, ceremonial, formal-sector, solemn. calm, mild, meek, bland, gentle. irregular, foreign, strange, exotic, unusual, abnormal, uncustomary, uncommon, unconventional. unrefined, provincial, uncivil, indecorous, inelegant, unpolished, rough, low-bred. indecent, unbecoming, unfit, inappropriate, unsuitable, unseemly. disorderly, unaffected, relaxed, customary, normal. lowbred, messy, unlogical, unfashionable, ungrammatical, unkempt, illogical, outmoded, real, improper, grungy, true, styleless, crass, tasteless, sloven, freewheeling, graceless, discourteous, wrinkled, slovenly, uncultivated, infelicitous, sloppy, coarse, uncouth, unlearned, unstylish, rumpled, sporty, lowbrow, inept, Ineloquent, ill-bred, crude, disheveled, low, actual, street, dowdy, uncultured, substandard, Unapt, representational, uneducated, unhappy, untidy, gross, incorrect, frowsy, mussy, unmannerly, unauthorized. I would not call my friend, Dirck Follock, anything else but Follock, unless it might be in a formal way, or when asking him to drink a glass of wine with me, for a great deal. It was a short, perfectly formal offer of marriage to her from Lord Talgarth. cotillion, promenade, masked ball, fancy-dress ball, prom, cotilion, masquerade ball.